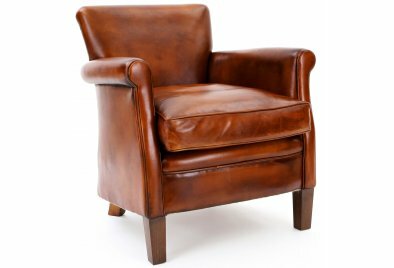 This is Birdie, a Leather Club Chair straight from the 30s! Her elegant rolling lines and curves are reminiscent of a vintage Bugatti and her sturdy, hand-polished frame shows the same level of craftsmanship. She has exquisite detailing - leather piping around her fascias and some beautiful hand-studding on her back. Talking of leather piping, her cushion has some too and what a big comfy cushion it is, but thats all thanks to the foam core with duck feather topping. Birdie sits perfectly under a window or next to a fire and likes to be just as warm and comfy as you. For a Leather Club Chair that's a bit more, well... eccentric, you should really meet Birdie's friend Eccentric!